Uncover spooky treasures with the Halloween-themed Howling Fun slots game. The spellbinding reels are filled with Dracula, witches, enchanting castle and mummy scatters, Devil wilds, a gamble feature, Prize Pick bonus, FREE Spins and multipliers! 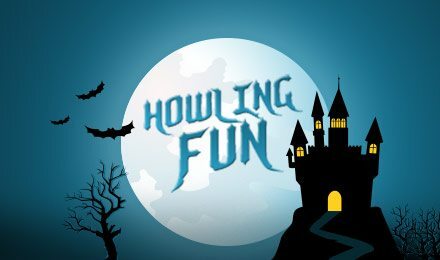 Dig out your scariest costume and prepare for some howling Halloween action with the Howling Fun Slots game. This 5-reel, 25-line online spooky slot game is bursting with haunting Dracula symbols, cackling witches, mysterious castles and a feast of entertaining Halloween action. If three or more Wild Devils rock up to the reels, you can double your wins. If three or more Castle Scatters fly onto the grid, you can snap up 5 extra FREE spins. If three or more scary Mummy Scatters show up, this can unlock the Prize Pick Bonus, where you can multiply your coins. You can also uncover the gamble feature, as you journey to spellbinding treasures!